Gallery Chaco is nestled within the heart of the mystical and now renowned Hotel Chaco. The luxury hotel serves as an homage to the treasured historic site Chaco Canyon, which was a central hub for trade and an important piece of history for the ancient pueblo people of these lands. From the stacked stone in the lobby to the stone floors that run like riverbeds, each piece of the building has a specific purpose. Gallery Chaco serves as an essential piece of the experience. It is a vessel of preservation and education for indigenous fine art. The gallery is here to tell the stories of not only the artists, but their native cultures. Art is a vehicle of expression with the power to preserve human history and emotion. With a wealth of art to share, Gallery Chaco is the educator and storyteller of Hotel Chaco. Weaved within the fabric of the hotel is Native American art that reflects both the beauty and history of Chaco Canyon. The talented group of Native artists commissioned for the project created works that capture the essence of Chaco Canyon and its enchanting past. With artists from different pueblos and backgrounds, the art is as versatile as the Native groups that first came together at Chaco Canyon. At Hotel Chaco the art isn't just found on the walls; it is all around. The Chaco experience begins before setting foot in the building, as the grand front doors were designed by Gallery Chaco's own renowned potter and bronze artist Tammy Garcia. When first commissioned to design the front doors and lobby oculus of the hotel, Tammy said, "I was immediately taken aback because these two pieces alone are such important parts of a structure. This is where you enter. This is the first thing you see when you look up. I was definitely honored. I was thrilled by this opportunity. And yes, I was up for the challenge." During the design process Tammy spent time researching the petroglyphs at Chaco Canyon. What eventually sparked inspiration for the front doors was the water serpent design. Hailing from Santa Clara Pueblo, the artist was already familiar with the iconic symbol. "Looking back at the petroglyphs at Chaco Canyon I saw that people from Chaco revered the serpent for what it resembled and the strength it had, since water is scarce in the Southwest. The water serpent came to resemble water so I thought it was important that they adorn the doors and are the first to greet people as they enter," said Tammy. 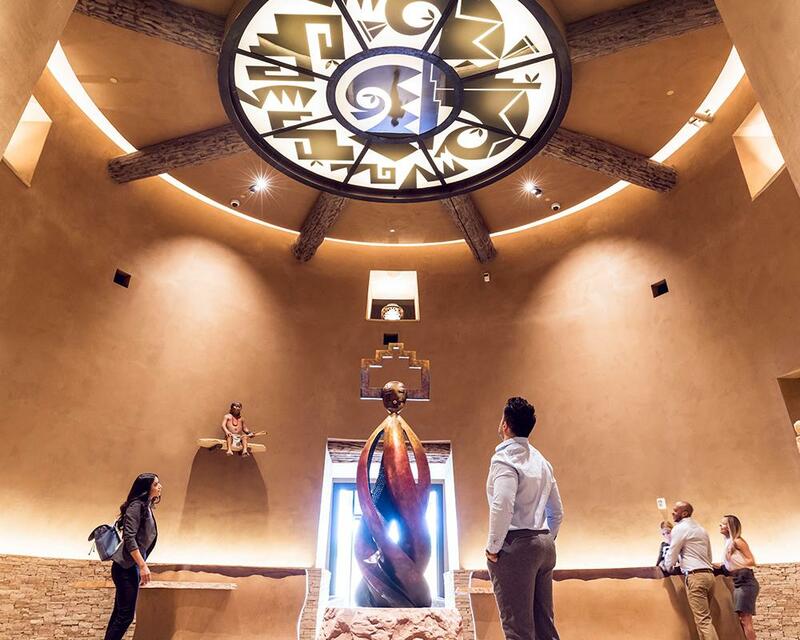 Artist Tammy Garcia from Santa Clara Pueblo describes the inspiration behind the designs of the metal doors and glass ceiling oculus at Hotel Chaco in Albuquerque, New Mexico. It was pueblo pottery that inspired the design for the lobby oculus. Tammy acknowledges the designs on pueblo pottery as a vital piece of Native culture because the designs tell the stories of the past. The pueblo peoples did not keep records on paper, but rather used the world around them to preserve their history. The symbols on pottery were one way these peoples kept knowledge with them and passed it down through the generations. One important reoccurring pottery symbol is the eagle. When asked about the final design Tammy said, "Immediately eagles came to mind. Eagles are a very important animal to the Natives of the Southwest because they represent strength and power. The eagle is one of the birds that can fly the highest and has the most reverence and respect from Native people. When I thought of the oculus I was thinking about when you look skyward and immediately eagles came into play. As you enter the hotel and the lobby, as you look up, you see the eagle." Paintings by Rhett Lynch located in the library at Hotel Chaco. Tammy Garcia is one of the many talented Native artists that brought Hotel Chaco to life. Gallery Chaco represents a large number of these creators. Joe Cajero created the bronze sculpture titled "Oneness" found in the center of the lobby. Roxanne Swentzell created the clay man named "The Guardian" who watches over the front desk. Patricia Michaels designed the Chaco inspired employee uniforms. Ira Lujan created the hand blown glass antlers that form the chandelier in the hallway. He also created the glass totems in the library and adorned one of the guest floors. Rhett Lynch created the large paintings in the library titled, "I Am, I Am Here." Tammy Garcia's bronzes are located throughout the hotel. Gallery Chaco is exclusively representing Tammy's bronze works and paintings. Mateo Romero created paintings for one of the guest floors. All of these amazing Native artists are represented in Gallery Chaco. From these artist's contributions in the hotel to their works in the gallery, the Chaco art experience is truly breathtaking.